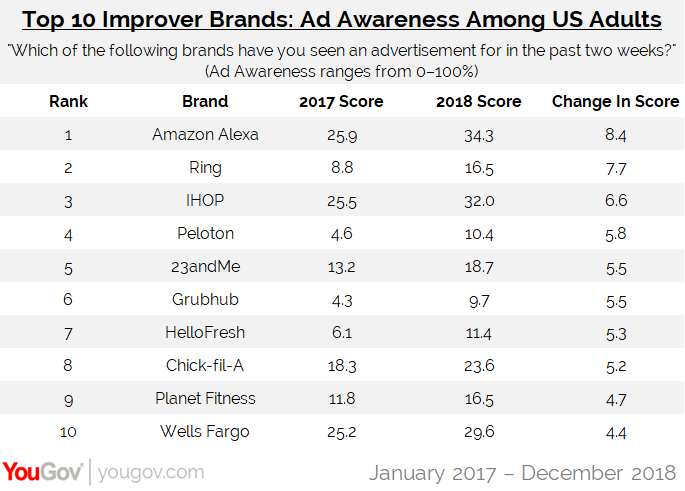 New data from YouGov Plan & Track shows that out of more than 1,800 brands, Amazon’s Alexa experienced the largest increase in Ad Awareness in 2018 compared to the year prior. When asked if they recall seeing an advertisement for the brand at any point in the past two weeks, throughout the past year an average of 34.3% of US consumers aged 18+ said they had. In 2017, Amazon’s Alexa had an Ad Awareness score of 25.9%, meaning it received a year-over-year bump of 8.4 percentage points. Amazon’s Ring also saw its Ad Awareness levels rise. In 2017, an average of 8.8% of US adults said they remember seeing an ad for the home security brand. In 2018, that figure rose to 16.5%. IHOP, which temporarily changed its name to IHOb, saw its year-over-year Ad Awareness score climb from 25.5% in 2017 to 32% in 2018. 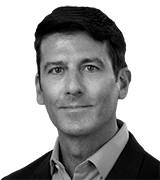 As for brands with the highest overall Ad Awareness, most are familiar names that have been a part of American life for decades. In first place, for example, comes insurance giant Geico, which received an average Ad Awareness score of 48.4% in 2018. 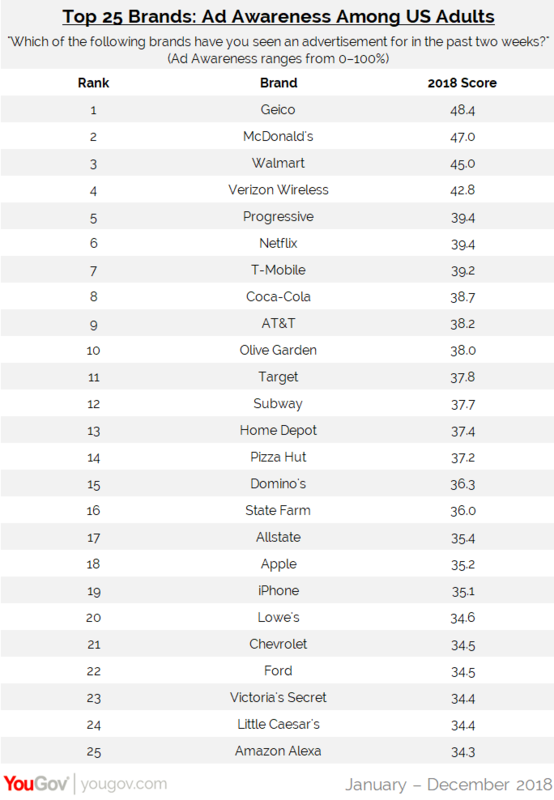 McDonald’s came in second place with 47%, followed by Walmart (45%) then Verizon (42.8%). With an average Ad Awareness score of 34.3%, Amazon’s Alexa took the 25th spot out of over 1,800 brands.